Armstrong's new DE stainless steel pumps can be used in many light industry petroleum and chemical applications. Armstrong Fluid Technology has announced that its Design Envelope (DE) 4380 Vertical In-Line pumps, designed for domestic water and light industrial use, are now available in stainless steel. The new DE stainless steel pumps are certified for safe drinking water systems to NSF-61 and NSF-372 standards and can also be used in many light industry petroleum and chemical applications. 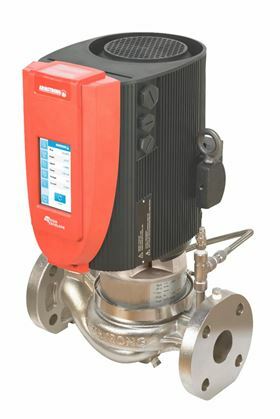 They offer advanced Design Envelope solutions which include DE Permanent Magnet (DEPM) motors, Parallel Sensorless Pump Control, built in wi-fi connectivity, touchscreen control and optional Pump Manager capability. The company says the new stainless steel DE pumps offer up to 70% energy savings, advanced hydraulic design with high levels of ﬂow efficiency and control algorithms that review operations constantly and adjust output. The pumps also have a smaller footprint and lower total weight than traditional units. The DE 4380 is available in six models ranging from 1 to 2hp, supporting performance levels from 10gpm to 1185gpm flow, and 10ft to 75ft head. It is designed for continuous low-pressure circulation, including water circulation, cooling towers, fountains, irrigation, spraying systems, condensate return and filtration. The Fireset™ HSC pumps by Armstrong have a tilted parting design to maximize efficiency by minimizing turbulence at the impeller eye.